Creators: Jonathan Hickman and Mike Deodato Jr.
Death Touch: Thane's left hand has the ability to instantly change the very economics of existence. He lacks control of his power, thus everyone within a certain radius of him is killed. Amber Encasement: Thane's right hand projects an amber construct which traps everyone within a certain radius of him and leaves them in a state of "living death. Containment Suit: Thane was given a containment suit by Ebony Maw, which altered his powers so they can only be utilised through direct contact. 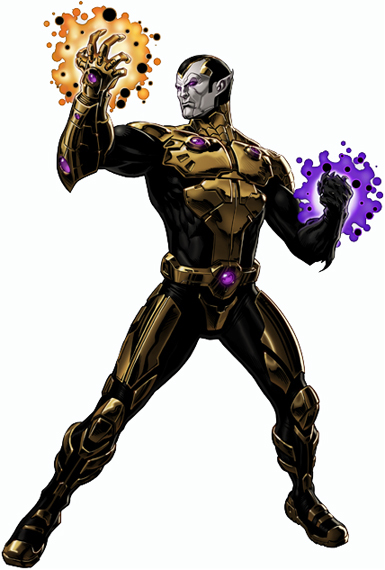 Black Vortex Empowerment: As a result of the cosmic power of the corrupting Black Vortex, Thane's cosmic potential was unleashed, vastly improving on all of his previous abilities and bestowing additional ones. He has used his cosmically enhanced power to encase the entirety of Spartax in his amber construct. Phoenix Force: After becoming the new host of the Phoenix Force, Thane was granted the great powers of the Phoenix. Thane has only displayed cosmic teleportation, but as an avatar, he should presumably possess the following abilities as well: Interstellar Travel, Cosmic Pyrokinesis, Resurrection, Immortality, Temporal Manipulation, Telepathy and Telekinesis. When Thanos encountered a tribe of Inhuman's living on a distant world, only one woman lived to tell the tale. She went to Earth bearing Thanos' child, who grew up in Greenland, becoming his community's healer. Later, when Thanos invaded Earth, Black Bolt set off a Terrigen bomb, activating all latent Inhumans across the planet. Thane was transformed in an instant, taking on a look similar to his father's, and gaining terrible powers that wiped out the community in which he'd grown up.